Introducing Zen into a creativity seminar provides stimulating discussions, invigorating stories, and compelling exercises. It is especially useful in shifting paradigms, redirecting participants� thinking, and sharpening their focus. Although there are around 1,700 different Zen koans and thousands of Zen stories (or sutras), which help reshape people�s perceptions, integrating a few in the curriculum are enough to set their thinking in a new direction. The koans are unanswerable questions, statements, or tales that are understood in a flash of realization, not through reasoning or logic. That moment is defined as enlightenment. For example, "What was the face your mother had before she was born?" Or "biting one�s own teeth." Or the story of the student who entered the monastery and asked to learn Zen. The Zen Master asked if he had eaten his porridge. The student said, "Yes." Then, the Zen Master said, "Then, you better wash your bowl." Unlike the koans, the sutras are stories told by Zen Masters about real monks and nuns exemplifying everyday life. These teachings are more easily grasped and demonstrate a detachment that enables Masters to offer compassion and enlightenment to others without becoming caught up in real-world, day-to-day pressures. Zen is a simple approach to everyday activities. Its simplicity is often disarming and difficult to grasp at first. One of the most significant changes in perception that can be introduced into the seminar is guiding people to be aware of the present moment. This state of "mindfulness" is also referred to as staying in the "now." This enables people to avoid being easily distracted. Zen has many aspects of learning, often referred to as the Way (do) of Zen. Some Zen-related Eastern philosophies have been popularized in films (like the Karate Kid series and The Last Samurai) and books (like Zen Flesh, Zen Bones and The Little Book of Zen), making Eastern thought somewhat familiar to people. Some of the Ways include chado, the tea ceremony; kendo, sword skills; kyudo, archery technique; judo, self-defense through Martial Arts; kado, floral design; shodo, the art of calligraphy and haiku, Zen poetry (a three-line structure, consisting of a five-syllable line, followed by a line of seven syllables and finished with one of five). One of the most basic elements of Zen is the practice of sitting or zazen. This activity forces people to become less internally chaotic and to become more centered, which leads to a greater clarity of thought. Just like scientists who get lost in thought during their research, many artists also lose themselves in their work. They can get so deeply involved, they forget to take breaks, to eat or even to realize how many hours have passed. To help people find their best creative solutions, encourage them to dig deeper and deeper. This helps them experience a sense of "timelessness." It prompts a fluid thought process, often referred to as "being in flow." One way to stimulate flow is to break the audience into small groups of 4 to 6 people. Ask them to come up with as many taglines as they can in less than 5 minutes. Don�t allow them to critique each other�s ideas or stop to discuss any one solution. By forcing them to keep moving, you�re propelling them into the state of flow. In this state, there is no judgment. The mind is completely free of critical commentary. Everything is just observed and absorbed. This approach helps to dispel tension within a group, because it enables people to listen non-judgmentally. The Zen story that helps explain this kind of thinking is the one that involves the village Zen master who is falsely accused of impregnating a teenage girl. The girl�s father goes to the Zen master�s home and hands the Zen master a baby, saying, "This is your baby. The one you had with my daughter. You take it care of it." The Zen master takes the baby and simply replies, "Is that so?" He then raised the baby for one year as if the child were his own. During this time, everyone shunned him in the village. One year later, the girl�s father returns to the Zen master�s home. This time, his head was bowed. He said, "Zen master, I am so sorry. My daughter confessed that the child was the baby of our neighbor�s son. I have come to take him back." With that the Zen master turned, picked up the baby and simply said, "Is that so?" Point out to the people how the Zen master did not defend himself or reprimand the man. He simply absorbed the information. The exercise for the group is to have them write in someone�s rhythm. Ask them to think of a celebrity and imagine how that person speaks. Now, tell them to write a 30-second TV commercial or radio spot in that celebrity�s natural rhythm. Remind audience members that if the talent speaks slowly, they may only need to write 18 seconds of copy for a 30-second spot. Conversely, if the celebrity speaks quickly, they may need to write 42 seconds of copy. This exercise forces them to write without judgment and accept the speed and cadence of the talent without having the freedom to change it. As a pre-workshop exercise, ask participants to bring in a CD with a song they Ask that they bring in the lyrics typed up, so they can be distributed to the rest of the group. Now, in groups of four, have them write a jingle using the chorus of the song. It sounds much easier than it is. They must choose a client and then write a jingle that matches the exact syllable count and word accent of the song�s refrain. Sometimes people come up with some catchy jingles. To have people understand "Mind Like Water," ask them to tell you what is the shape of water. They usually laugh and say, "It�s whatever shape it�s in." So, explain it�s flat in a flat dish, vertical in a vase, circular in a bowl and so on. Then, ask them to imagine their minds able to wrap around any kind of idea. Then, give them this exercise. Tell them to create a brand new product. It could be a new frozen coffee product. A new kind of chip. A new kind of energy bar. The key here is, it has to be new. Not just a new flavor, a new product. For instance, for a frozen coffee product, it could be a frozen coffee ice cream on a stick with shaved coffee beans and slivers of chocolate with bursts of real liquid coffee set in tiny cubes or spheres. The coffee cubes could be in different flavors like hazelnut, coconut, vanilla cream, etc. The idea here is to make the come up with something NEW. Then, to create a clever name for this product. Part two of the exercise appears in the next section. Let them have fun working in groups. Have them use flip charts or work on large sheets of paper together. The plan is to let them feel free creatively and experience joy in the process. Always allow time for the groups to share their ideas with each other. A common problem in teams is idea ownership or attachment. Sometimes people in the group cannot release the idea and move forward with someone else�s idea. They must cling to and defend whatever concept they developed. This pride of authorship can undermine the creative flow in the entire group. When this occurs, it is helpful to tell people about the nature of the tree. At first, they don�t understand what trees have to do with brainstorming. But, eventually, they start to understand. Suggest that they consider what their lives would be like if they could never move from one spot. What would it be like to have to stay wherever you were forever? Wait a few seconds before continuing, so they can fully absorb and then reflect on the concept of permanent immobility. Then, ask them to think about the tree. Tell them the tree never denies or prevents interaction. The tree never puts a sign out that says: "No squirrels on Tuesday." "No birds on Thursday." Or "no nest building on weekends." Not at all. The tree allows all activities. It shares its space, its branches, its trunk. It allows for every kind of interaction with all kinds of creatures. Then, ask them how they would feel if total strangers moved into their house for unlimited periods of time. What if relatives from another country dropped in for a few weeks or months without asking permission. Then, ask them if just for a few minutes, they could be like the tree and be inclusive to all ideas and suggestions. Let them try to hear each other openly and invite participation from everyone in the group. Remind them, that they must allow and not deny all interaction, just like the tree. If you ask people what children do after they finish playing with the new toy, they often say that kids play with the box it came in. Why is it that the box is more entertaining than the toy? Because it has limitless possibilities. Children can climb in the box, if it�s large enough, and pretend they�re exploring a cave, or flying a space ship, or riding in a submarine. They can be anywhere they want to be, because the box allows them to use their imaginations and create any environment or adventure around it. Tell the audience that just like the box has four sides and some physical restrictions, the haiku, a Japanese poetic form, also has some restrictions, as mentioned earlier. Once again, remind them this poetic form is created in just three lines with a specific number of syllables per line: 5 syllables, followed by 7, then returning to 5 again. Have them work in groups of four to write a haiku that advertises a product. But, first, ask them what kind of product would work well with this kind of structure. They might say a spa, an elegant hotel, a cruise line, a shampoo, or even a children�s toy. After allowing about 15 minutes, have each group present the haiku it created. People often surprise each other with the creative haikus they wrote. fish tracks in a dry riverbed. is the most difficult to blow. It only functions when open. Burgess, Randy, ed. (1995) Zen, Kansas City: Andrews & McMeel, p. 31, 60-61. Bendinger, Bruce (2002) The Copy Work Shop, 3rd ed. Chicago: The Copy Workshop, p. 114-115. Goleman, Daniel, Paul Kaufman and Michael Ray (1991) The Creative Spirit, New York: Penguin, pp. 46-51. Man-Tu Lee, Anthony and David Weiss ( 2002) Zen in 10 Simple Lessons, New York: Barron�s, p. 38-39, 44, 68-69, 98-99. Mascetti, Manuela Dunn (ed.) (2001)The Little Book of Zen, New York: Barnes & Noble, p. 14, 58, 70, 112. Reps, Paul and Nyogen Senzaki (compilers) (1994) Zen Flesh, Zen Bones, Boston: Shambhala, p. 175. 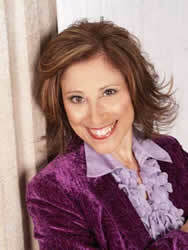 Margo Berman, has been a Marketing Consultant for 20 years, with her own ad and PR agency - Global Impact. As a creative talent, she's won numerous regional, national and international awards, with clients like: American Express, Alamo Rent A Car, and Banana Boat. See Ms. Berman's Profile on Experts.com.